Mario Draghi’s speeches, UK inflation data, German ZEW Economic Sentiment, Rate decision in Japan, US Building Permits and FOMC Meeting Minutes, as wee as inflation and employment data. These are the major events on FX calendar. Here is an outlook on the highlights of this week. Last week, U.S. retail sales edged up 0.3% in October, indicating stronger spending boosting domestic economy. The increase was higher than forecasted. Analysts expect the U.S. economy will expand around 3% next year, the strongest growth rate since the 2007-09 recession. Core sales excluding automobiles also gained 0.3%, beating expectations for a 0.2% gain. Will this trend continue? Mario Draghi speaks: Monday, 14:00 & Friday, 8:00. ECB President Mario Dragh is expected to testify before the Committee on Economic and Monetary Affairs, in Brussels and speak in Frankfurt. Market volatility is expected. UK inflation data: Tuesday, 8:30. UK inflation dropped to a five-year low of 1.2% in September following 1.5% the prior month. The main price decline occurred in the energy and food sectors. Despite the strong growth in the UK economy, inflationary pressures remain subdued; it is unlikely that the BoE will raise rates before 2015. UK inflation is expected to remain at 1.2%. Eurozone German ZEW Economic Sentiment: Tuesday 9:00. Investors’ sentiment plunged in October to its lowest level since November 2012, reaching minus 3.6 points. The ZEW index fell by 10.5 points negative territory, for the first time. Economists expect confidence to remain low over the medium term. Recent disappointing data such as factory orders, industrial production, and foreign trade have contributed to the sharp decline. German economic sentiment is expected to reach 0.9 points this time. US PPI: Tuesday, 12:30. Producer prices for finished goods declined in September by 0.1% following an unchanged reading in the previous month. Economists expected a price rise of 0.1%. Meanwhile, core PPI excluding the volatile food and energy sectors came out flat. Unadjusted, the producer price index for final demand rose 1.6% for the 12 months that ended in September. Producer prices are expected to drop again by 0.1%. Japan rate decision: Wednesday. The Bank of Japan surprised markets in October while deciding to expand its massive stimulus spending, admitting that economic growth and inflation have not picked up as expected following a sales tax hike in April. BOJ Governor Haruhiko Kuroda announced that the expansion was done to ensure the early achievement of the 2% inflation target and end deflation. Analysts were not expecting further easing measures in such short period. US Building Permits: Wednesday, 12:30. US Building permits increased in September 1.5% to an annualized rate of 1.02 million, suggesting the U.S. economy continues to strengthen despite the global slowdown. Building of multifamily projects such as condominiums and townhomes jumped 16.7 percent to an annual rate of 371,000. Work on single-family properties rose 1.1 percent to a 646,000 rate in September from 639,000 the prior month. The positive trend is also evident in factory production and the job market, posting the lowest level of jobless claims in 14 years. US Building permits are predicted to reach 1.04 million. FOMC Meeting Minutes: Wednesday, 18:00. The Fed FOMC minutes from the September meeting were mostly dovish. The minutes stressed that the Fed will be lenient in its exit strategy. The focus now is on exit strategy for pulling down the Fed’s balance sheet. Regarding the outlook for the fed funds rate, some noted that markets’ outlook is below FOMC forecasts. Several participants see inflation running below Fed goal for quite some time. US Inflation data: Thursday, 12:30. U.S. consumer prices increased mildly in September, showing weak inflation pressures, providing the Federal Reserve ample room to keep interest rates low for an extended period. CPI increased by 0.1% after a 0.2% fall in the previous month. Economists expected a flat reading in September. Sluggish wage growth helped to keep prices nearly unchanged. Meanwhile core CPI excluding food and energy prices, gained 0.1% in September, while the year-on-year change held steady at 1.7%. CPI is expected to drop 0.1% while core CPI is predicted to gain 0.2%. US Unemployment Claims: Thursday, 12:30. The Labor Department release showed a rise of 12,000 in initial claims last week, reaching 290K. The increase was larger than expected, but remained below 300,000 for ninth straight week indicating the US job market is stronger than ever. Another good sign was a rise in the number of Americans quitting their jobs under their own volition, suggesting stronger confidence in the labor market condition. The number of jobless claims is expected to decline to 286K. US Philly Fed Manufacturing Index: Thursday, 14:00. The manufacturing sector in the Philadelphia region continued to weaken in October, falling to 20.7, after September’s reading of 22.5. However despite the modest decline, Philadelphia manufacturing still shows growth. New orders edged up to 17.3, compared to September’s reading of 15.5; the employment index declined to 12.1, following 21.2 in September; and the six-month outlook dropped to 54.5, compared the precious reading of 56.0. The manufacturing sector in Philadelphia us expected to reach 18.9 this time. Last edited by 1Finance; 11-14-2014 at 03:37 PM. The Bank of England (BoE) Minutes are widely expected to show another 7-2 split within the Monetary Policy Committee (MPC) as the majority retains a wait-and-see approach, and the policy meeting minutes may do little to increase the appeal of the British Pound as the central bank curbs its growth and inflation forecast. Even though the BoE remains on course to raise the benchmark interest rate in 2015, the downward revisions delivered in the quarterly inflation report favors a bearish outlook for GBP/USD as Governor Mark Carney adopts a more dovish tone for monetary policy and warns of the ‘large disinflation pressures’ coming from abroad. With that said, easing interest rate expectations is likely produce further headwinds for the sterling, but positive data prints coming out of the U.K. may generate a near-term correction in GBP/USD as the central bank sees the economy returning to normal. As a result, a rebound in the U.K’s core Consumer Price Index (CPI) along with a marked pickup in Retail Sales may spur a bullish reaction in GBP/USD, but we will for an extension of the series of lower highs & lows in the exchange rate as it retains the bearish trend dating back to July. In turn, we will retain the approach to sell-bounces in GBP/USD and watch former support around the 1.5890-1.5900 for new resistance, with the next downside region of interest coming in around 1.5540-50, the 78.6% Fibonacci retracement from the August 2013 low. The Swiss Franc has faded into the background as an object of speculation in its own right over recent years. A steady monetary policy centered on a commitment to maintain a EURCHF floor at 1.20 amplified the already significant historical correlation between the Swiss unit and the Euro, largely framing the outlook on the former currency in terms of developments with the latter. This may soon change as EURCHF flirts with breaching the SNB’s defenses on the eve of a crucial referendum whose outcome may be seen as undermining the central bank’s ability to respond. Switzerland will take to the polls on November 30 to decide on a measure that would require the SNB to maintain 20 percent of its reserves as gold, which it would subsequently not be allowed to sell. The monetary authority would also have to repatriate the gold it owns but stores offshore (largely in the UK and Canada). As of September, the SNB held about 7.6 percent ($38.9 billion) of a total of $530.9 billion in reserves as gold. 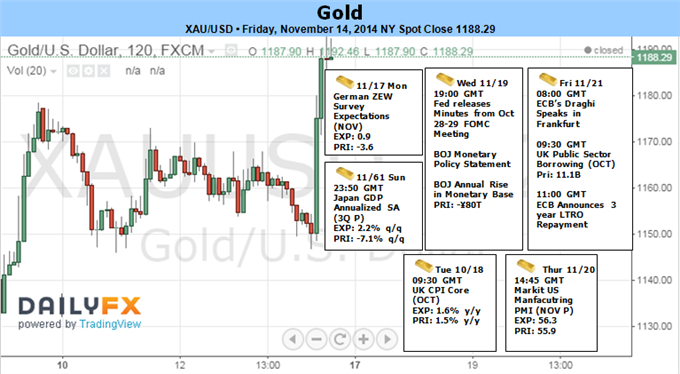 Using that as a baseline, getting to 20 percent would imply a purchase of an additional $106.2 billion in gold. The latest polling results ahead of the referendum published on October 31 showed 47 percent of respondents were against the initiative, 38 percent were in favor, and 15 percent were undecided. 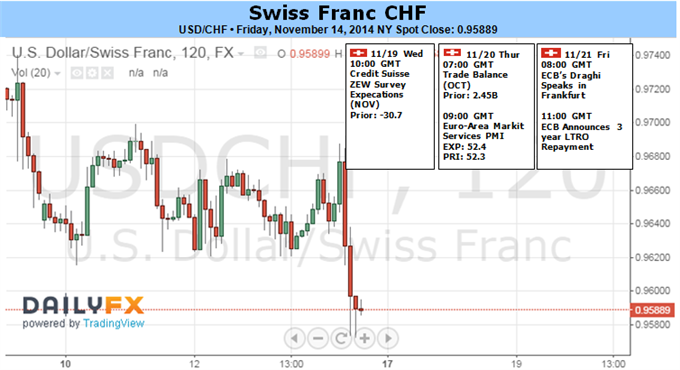 The Swiss Franc may breach the 1.20 threshold against the Euro in the event of a “yes” vote. This initial response would reflect the newfound complications to maintaining the barrier. To date, the SNB has been able to defend its policy relatively easily because it can effectively “print” as much of its own currency as needed and use it to buy Euros in the market. Growing FX reserves in this way given a 20 percent gold holdings requirement would imply a large parallel purchase of the yellow metal. To avoid undermining their own EURCHF efforts, the SNB would have to use its non-Euro FX holdings to make this purchase. That has raised worries that the floor can only hold while the SNB has the stock of FX needed to maintain it and would eventually give way once reserves run out. Such concerns seem misplaced. The latest SNB data shows it holds 53.2 percent of its reserves in currencies other than the Euro. The monetary authority has increased its total reserve holdings by an average of CHF7.2 billion per month since the introduction of the EURCHF floor in August 2011. Assuming this pace is maintained and adjusting for the additional outlay needed to bring current gold reserves to 20 percent of the total, the SNB would not run out of ammunition for close to 12 years. Considered together with the 5 years allotted to the central bank in the referendum terms to bring its gold position up to snuff, this means that no radical policy change need necessarily occur if a “yes” vote emerges. In practical terms, this suggests that if EURCHF dips below 1.20 on a short-term basis after the votes are counted, the move is unlikely to mark the beginning of a lasting downturn. The Dollar’s performance this past week was uneven but ultimately positive for the Dow Jones FXCM Dollar Index (ticker = USDollar). Recently, the currency has found most of progress through the miscues of certain counterparts – a global Yen drop on the BoJ’s recent stimulus upgrade or a GBPUSD tumble after the Bank of England’s Quarterly Inflation report changed the standings for rate expectations. For the Greenback itself, the fundamental sparks were minimal on a light economic docket and exceptionally quiet ‘risk’ backdrop. For traders looking for volatility and fundamental balance, this bout of ‘tranquility’ is unlikely to last for much longer though. With an impossibly quiet bearing from the S&P 500, the approach of key monetary policy-related data and unfolding themes amongst its major counterparts; the Dollar is unlikely to escape without a charge. Fundamentally speaking, our top concern should always be the theme that holds the greatest market-moving potential without straying into the realm of a ‘black swan’ (a highly unlikely event or scenario). A more motivated unwinding of risky exposure is far from a black swan – it is a warning being sounded by international economic organizations, governments and monetary policy authorities. However, perceptions of an imminent threat are minimized when benchmarks like the S&P 500 are closing at record highs. It is true that US equity indexes are scaling uncharted territory and the VIX volatility measure has collapsed. Yet, other assets affected by sentiment are not so sanguine. Other developed world capital markets, carry appetite (outside JPY), high-yield assets, commodities, emerging markets and others are significantly weaker. The disparity between the S&P 500 as a hold out and its financial market counterparts is in part a relative performance/economic vote, but it is primarily fostered by a lack of commitment to build upon or unwind existing exposure. Such ‘complacency’ in an actively changing global environment of economic growth, finance and geopolitics cannot last. And, the signs of a disconnected sense of awareness seem to hit extreme levels. The S&P 500’s chart shows a hyperbolic, four-week rally to record highs is flagging and showing contrast with fading volume. In fact, the 5-day (one trading week) realized volatility level for the market dropped to 1 percent – the quietest reading since 2005 set against a standard VIX measure that is already straying from the broader market. The Australian Dollar has witnessed some surprising resilience over the past week with it posting modest gains against most of its peers. The driving force behind the small advance may have been a general drive to yield, given similar gains were witnessed for risk sentiment proxies (S&P 500). 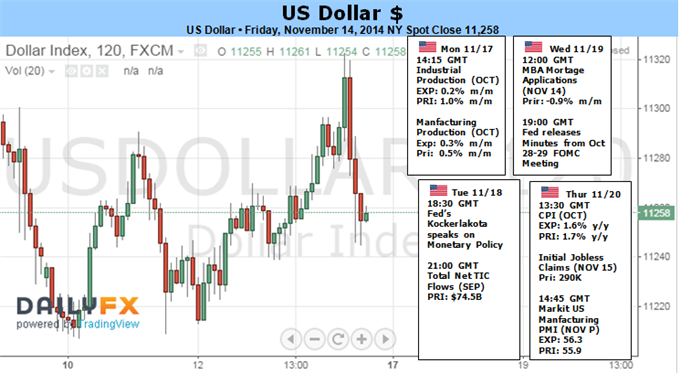 Meanwhile, regional economic data once again proved uneventful for the commodity currency. The coming week brings the release of the RBA’s November Meeting Minutes. The decision itself proved a non-event for the AUD and given the fairly well broadcast views from the Board, the Minutes are unlikely to deliver anyrevelations for traders. Similarly, upcoming Chinese data may see another muted response from the currency since it would likely take a significant deterioration over an extended period to generate a response from RBA officials. 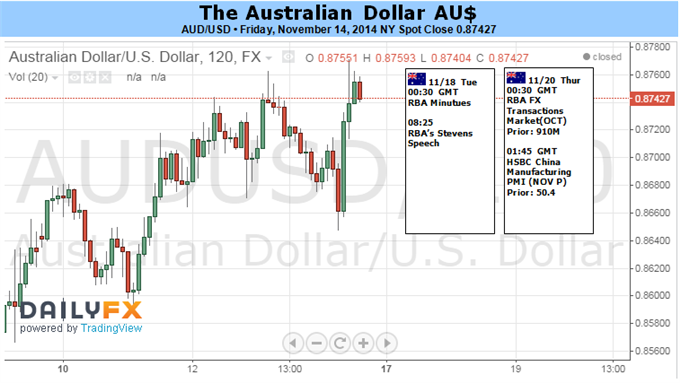 This could leave the AUD to continue to seek guidance from sources outside of domestic monetary policy expectations. The potential for general positive risk sentiment to act as a sustainable fuel source for the Aussie may be limited. This is given implied volatility levels are near their 2014 highs, suggesting traders are anticipating some strong swings amongst the major currency pairs. This in turn may detract from the carry appeal of the Aussie and could limit the scope for further gains. Speculative trader positioning (reflected in the latest COT report) reveals short positions are still some distance away from the extremes witnessed early last year. In turn this suggests the short AUD trade remains ‘uncrowded’. Gold prices are higher this week with the yellow metal rallying 1.11% to trade at $1189 ahead of the New York close on Friday. Bullion traded to fresh monthly highs on the back of broad-based USD weakness and the precious metal may extend the recent recovery as Fed officials remain reluctant to move away from the zero-interest rate policy (ZIRP). The Federal Open Market Committee’s (FOMC) policy meeting minutes highlights the biggest event risk for gold especially as the central bank halts its asset-purchase program. Despite expectations of seeing higher borrowing-costs in 2015, the policy statement may continue to show central bank hawks Charles Plosser and Richard Fisher dissent against the majority amid the ongoing improvement in the labor market. Nevertheless, it seems as though the committee is in no rush to normalize monetary policy as subdued wage growth paired with easing commodity prices dampens the outlook for inflation. In turn, the precious metal may continue to retrace the sharp decline from the previous month should we see a more dovish twist to the forward-guidance for monetary policy. Last week we noted that, “gold looks poised for further topside in the near-term with Friday’s price action posting a massive outside reversal candle. The snap-back from extremes in the momentum signature suggests this is likely to be a simple bear market rally with topside objectives eyed at $1180, 1192 & 1206/07 (where we would be looking for favorable short entries).” This week’s rally failed just ahead of our second objective at 1190 and our outlook remains unchanged as the pair posted yet another massive outside day reversal again this Friday. Bottom line: looking higher near-term for favorable short entries with only a breach above $1207 invalidating our broader bearish directional bias. The EUR/USD pair initially fell during the course of the week, but as you can see found enough support to turn things back around and form a nice hammer. Because of this, it appears the market is ready to bounce from here, and perhaps even go as high as 1.28 before it’s all said and done. Nonetheless, we do not like buying this pair and we do believe that eventually that any rally from here will simply represent value in the US dollar that will force people to come into this market and sell. 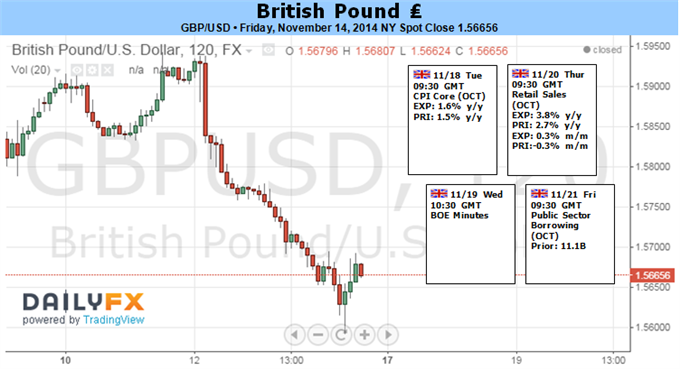 The GBP/USD pair broke down during the course of the week, and now looks very bearish. Because of this, we feel that this market will then go to the 1.55 handle, and then possibly 1.50 handle given enough time. Rallies at this point in time should continue to be selling opportunities, as we believe the 1.60 level is now the” ceiling” of this particular currency pair. The US dollar is by far the most favored currency in the world, and we don’t see that changing anytime soon as the Federal Reserve has left the quantitative easing game. The NZD/USD pair fell during the course of the week initially, but then bounced enough to close just above the 0.79 handle. Because of this, we feel that the market may very well test the 0.80 handle, but at that point time we would expect a lot of sellers to step into this marketplace. We are still bearish of this market overall as the central bank out of Wellington wants to see this pair go much lower, so we are simply waiting for some type of resistant candle in order to sell this currency pair. The USD/CAD pair rose during the course of the week initially, but then turned back around and form a shooting star. This is the second week in a row that we have seen the shooting star at the 1.13 level, so therefore looks like we are going to continue to grind in this general vicinity. That being the case, we feel that long-term traders will favor upside positions, but at this point time this really nothing on this chart to make you want to start buying this pair.